Gotham's upcoming final season is set to fulfill plenty of fans' wishes -- including a very particular piece of facial hair. 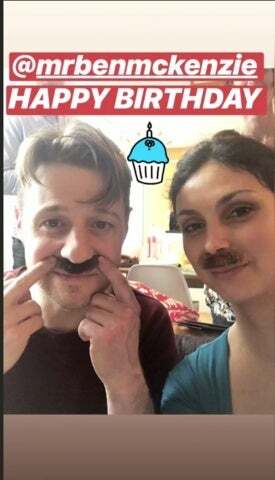 Last week, Morena Baccarin, who portrays Leslie Thompkins on the beloved Fox series, shared a photo of herself and co-star Ben McKenzie on her Instagram story. The post, which you can check a screenshot of below, sees the pair of them sporting Jim Gordon-esque mustaches. It's unclear if McKenzie's facial hair is actually what he will be sporting in Gotham Season 5, as the series' showrunners have hinted that he will be "growing facial hair" for the season. But either way, the photo is sure to delight diehard fans of the series. The next batch of Gotham episodes are still shrouded in a bit of mystery at this point, but it sounds like Gordon's impact on the series -- and on Bruce Wayne (David Mazouz) -- definitely won't be slowing down. "I'm working on that, they're the perfect ages to be brainwashed," McKenzie joked on a recent appearance on The Late Show with Stephen Colbert. "I explained to them the truth, which is that without Jim Gordon, there would be no Batman. If you really think about it, and I encourage you to really think about, you could almost argue that Gordon was the first Batman. He's the first lawman in Gotham City, and he's keeping it together." "He's gonna be out there helping people," Mazouz told ComicBook.com during this summer's San Diego Comic-Con. "At the beginning, he's going to be very concerned with Selina, because we know what happened with her. So that's going to be a big struggle, how to help her if there's any way he can help her. Eventually, he's going to realize that the GCPD, Jim Gordon has been so desperately trying to hold this light to Gotham, literally and metaphorically. To show the villains that there are good people, to show the good people that there are people to protect them. But eventually, as we all know, that's not gonna be enough, and Bruce is going to see that. He's going to look at people like Penguin, and look at people who are the roots of corruption and the roots of abuses of power and realize that only somebody like Batman can take them down. He's going to become what he needs to become." Are you excited to see Jim Gordon get his mustache in Gotham Season 5? Let us know what you think in the comments below. Gotham is set to return to FOX at some point in early 2019.